The authro’s website (linked to below) gives all the information you need and I recommend you visit it. This mod contains two almost duplicate mods. One uses cinematic sequences to tell the story, the other uses scripted scenes. Not only that but there are two endings, which are decided by your actions earlier in the mod. Copy the Compromised folder into your SourceMods folder. Compromised should now be listed in your Library tab. This is a great little mod and it’s nice to see this type of thing being developed. It looks into the same question I posed in Poll Question 079. The images above are taken from the cinematic version and I started to play the Scripted Sequence version but I stopped because I just didn’t want to play it again. However, let me qualify that statement. It’s not because the mod was bad or boring I just don’t like playing things more than once. I also have a headache and wanted to just post it and turn the PC off. The playable action is quite good, although the balance between playing seemed to be about 50/50 and I prefer to play rather than watch. It was just a test level, so that is a little unfair to use that as a negative, but it is important. There were a few other things I could list as negatives but to be honest I feel I am being overly picky and should step back and realize that this is a great piece of work. The voice acting is very good and just as importantly the lines fit perfectly – please note other mod authors. Favourite lines include “You want Mission Impossible or Rambo” and “She did it with nothing more than spit and a pair of pliers” Great stuff. There’s no doubt in my mind that you should play it, the question is which version to play first. I did encounter one problem and that was with the choice I faced near the end of the mod. The author assigned a key but didn’t seem to take into account players change the assigned keys and I couldn’t make the choice I wanted. A small error that had significant implications. I didn’t get the “key” thing, (maybe because I didn’t choose to…Hm, no I simply waited out that bit so I don’t know what happened if you…. (No spoilers here!)) 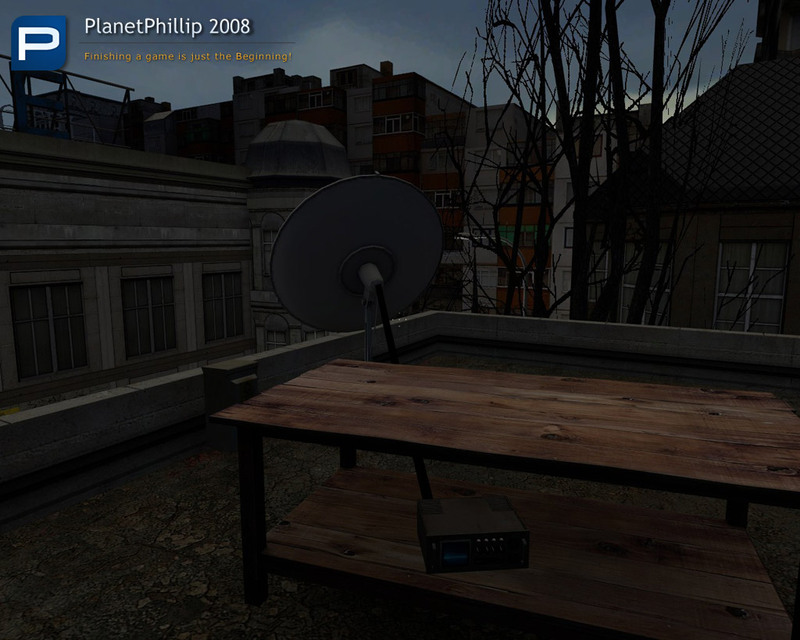 more or less every map/mod I go for the default settings, whether HL1 or 2, and it hasn’t (yet) been a problem…But I liked this Mod.I wanted more, though thinking about it I did play it though on both “cinematic” and “scripted” and had hoped the difference(s) would be more pronounced than they actually were. Surely not enough to write a thesis on…? Still the combat was straight forward and honest, if a bit easy, you never actually need any of the ammo or healthkits as far as I could see…and I am by no means anything other than an average player, so you hard shooters out there shouldn’t have any problem at all…I hope that more mods make use of the cinematic cut scene thing in the future as it seemed to add a bit of depth to it, and Philip is right, the voice acting was very good, and added to the experience. I hope the author & presumably his pals can do some more HL2 stuff, because if this is anything to go by then it should rock!It might be relatively short, but a lot of thought has clearly gone into the project, give it a whirl. Not sure why, but it isn’t uploading to the Steam menu after putting the Compromise folder in the Sourcemods, as per usual method. Strange. I was going to ask how big your Compromised folder was, but then I remembered I have save points and lots of screenshots. I presume you have tried deleting it and trying again. WHich is exactlyt he same as the Filecloud version. Of course it could just be a glitch and it’s working now. Hi. thanks for trying to help. I did a re-download/re-install but still no luck. It unpacks to 90.8 mb and got copied over as usual to SM folder, still no go on Steam menu. Oh well. It looked kinda cool, woulda gave it a shot, just doesn’t like my PC or something, I guess. Do you have episode 2?This uses content from ep2 so maybe thats why if you dont have it.Or maybe try downloading the orange box sdk from the tools tab in steam if you don’t have that.I would think it would still show in the menu regardless thou. Well, I think you nailed the problem, although it still doesn’t load. 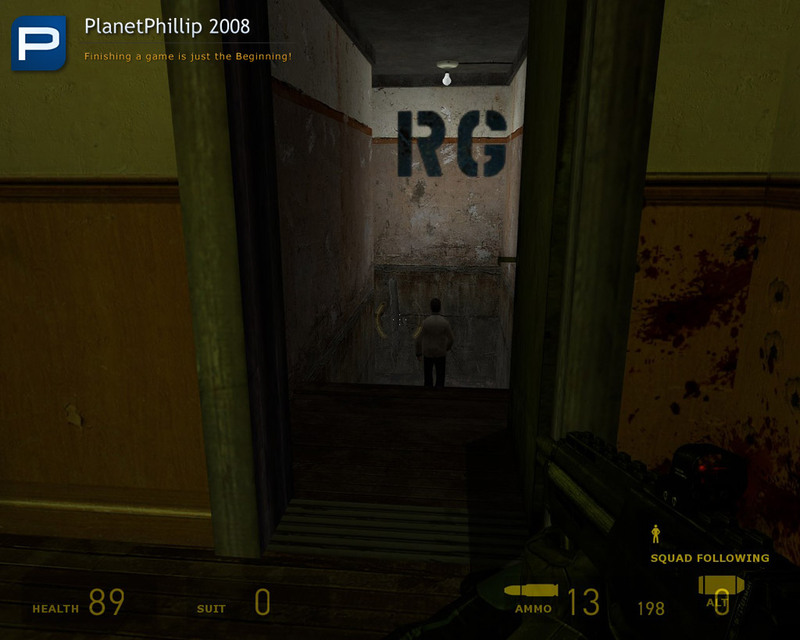 not from the the HL2/Ep2 folder. Orange Box, I guess I can’t make it go “zoom” just yet. Thanks for all your help though, I do appreciate it. get through a long boring night at these latitudes with some really great mods. This is my fault and I apologize. 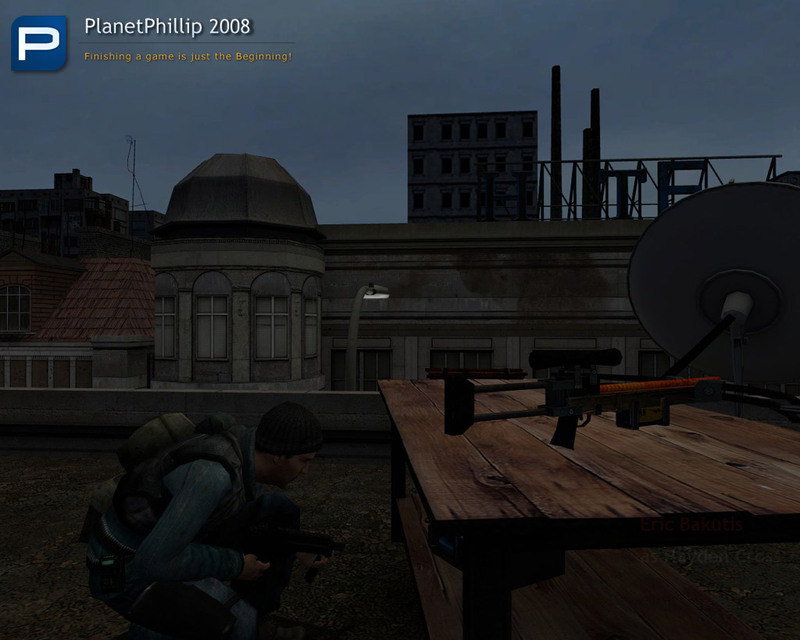 When I found this mod it said nothing about Episode Two and I even checked the gameinfo file, which just mentions HL2. 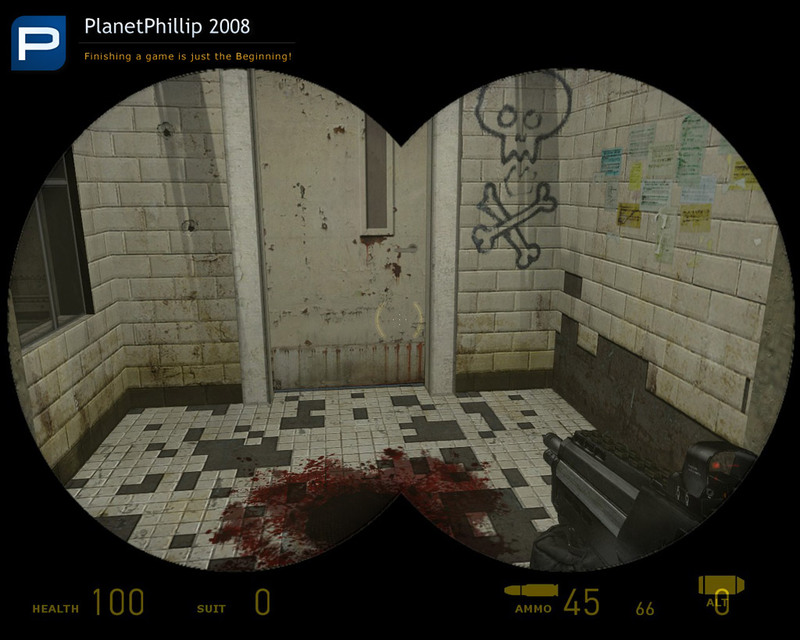 I there fore believed it only needed HL2. 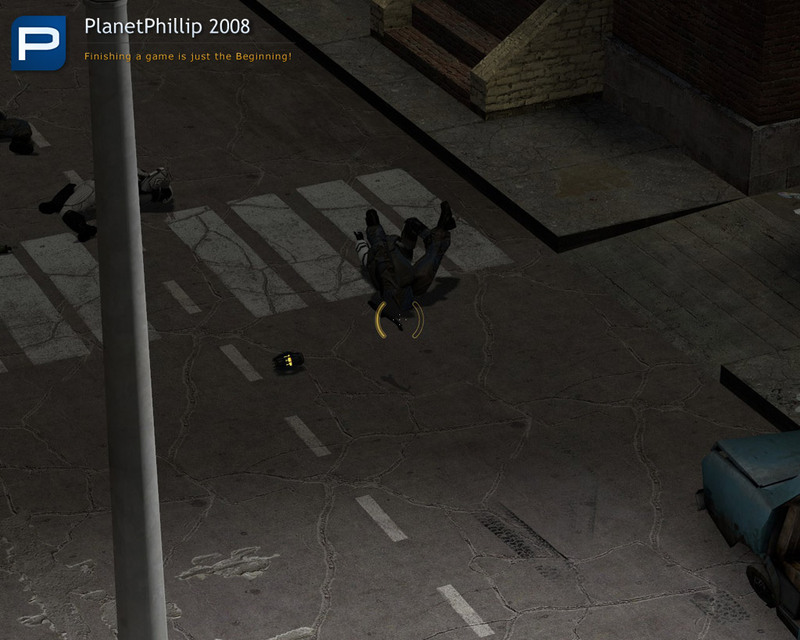 Now that I look at some EP 2 mods, even they only say HL2, not Ep2 in their gameinfo file. When you say “although it still doesn’t load” do you know mean it’s visible from the Games menu? As andyb says, not having EP2 shouldn’t make any difference as to whether it is visible in the games menu or not. If it’s still not visible then there is something else going on as well. IS it not possible to buy via Steam? Or do you not like using that service? 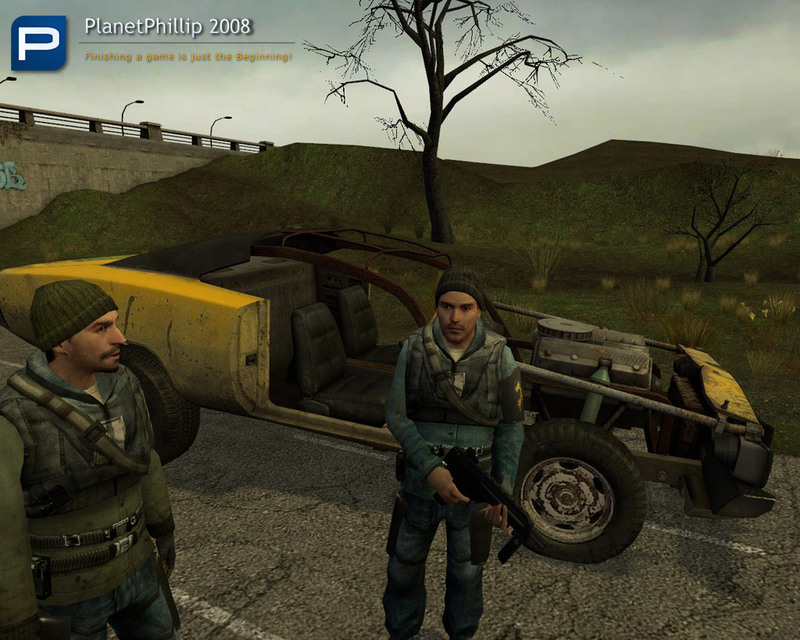 I will be renaming and editing the details to reflect the EP2 status, and once I saw the Jalopy I should have realized. It’s an interesting idea to compare as directly as possible two styles of game play: storytelling through cutscenes or storytelling through in-game conversations. I think the use of in-game notes, emails etc (not employed in this mod) also falls into the cutscene category, especially if you have no control over how long the text is displayed for. Playing this mod both ways confirms for me something I feel very strongly – cutscenes should be kept to an absolute minimum and preferably completely eliminated. They break the immersion (you’re usually suddenly switched to third-person view), and are usually very slackly edited and paced. HL and HL2 don’t use them at all as far as I can recall, so you are always in character and that is one reason those games are classics. 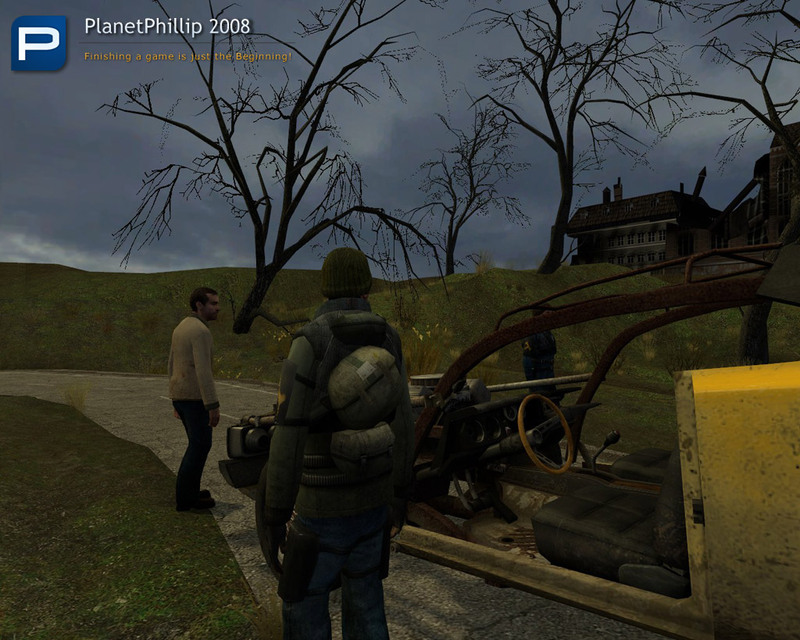 Many mods have interminable cutscenes which are used as an opportunity to show off film director skills rather than to tell the story and build the tension. The relationship between games and films is intriguing and you could argue that a game with cutscenes is a halfway house between the two genres. I think that games are a valid art form separate from and in some ways beyond film, so would prefer no blurring of the lines: films are 100% cutscene and games should be 0% cutscene! No, it still wasn’t visible in the Steam/Games menu, even after the SDK orange box update, so, not sure what to think there. I just noticed this was hosted elsewhere than my portfolio after receiving a few e-mails about bugs, and then I remembered Phillip actually asked me for permission to host it, I merely forgot to look–this led me to put two and two together at last. Ha! First I wanted to thank Phillip for putting this up–the presentation on this site is excellent. Secondly I wanted to clarify a few things regarding the project. 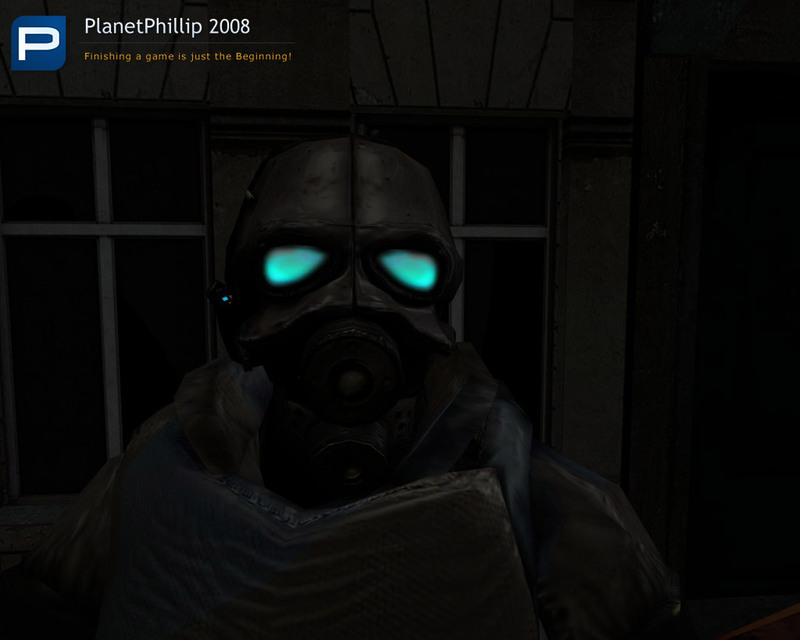 I published this as a mod mainly because I couldn’t figure out how to get custom Faceposer scene files to work with the latest version of Half-Life 2 (look into stuff related to the scenes.image they added for the PS2 version if you’re curious). 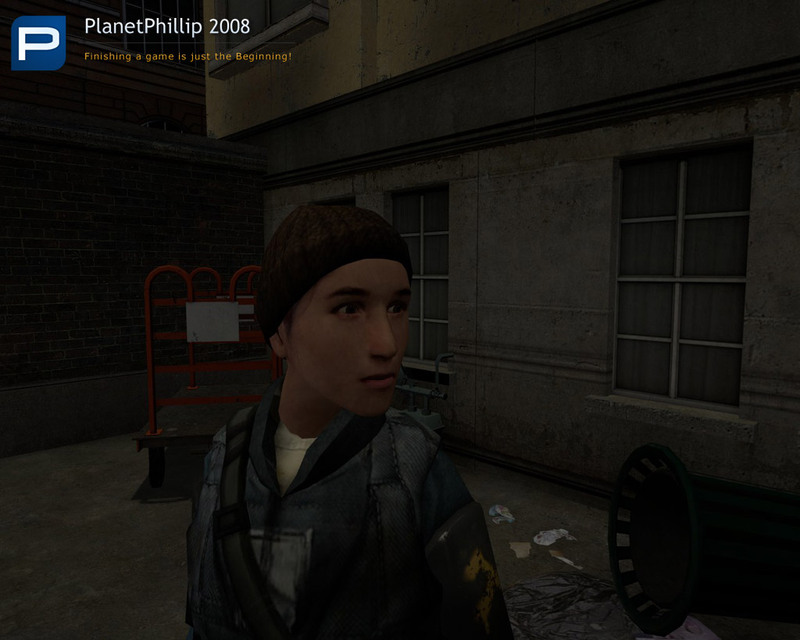 So it’s not technically a mod inasmuch as a Half-Life 2 level that I had to cram into a mod in order to use custom Faceposer scenes. Just a few notes on the thesis project itself–I got some very interesting results, and I actually think even the scripted sequences should have been cut down–the main thing that annoyed my players was not whether they watched a cutscene or a scripted sequence but when they were artifically delayed for any reason, regardless of presentation. So, halting the player’s progress (even if they watch a scene in ‘real-time” as opposed to third person) still makes it harder for players to enjoy playing a game. I did have a noticable percentage of people who played the ‘scripted sequence” version miss important elements of the storyline, wheras I had almost 100% comprehension with the “Cinematic version’, so there is definatelly a benefit to cutscenes when it comes to explaining plot. My final suggestion was to use cutscenes to introduce a level (basically set up the plot) and conclude it (reward the player for completed gameplay with a cool cutscene) but keep any and all interruptions *during* the level (both cutscenes and scripted sequences) to a minimum during gameplay itself. This seems to be the best compromise (pun!) between the two storytelling approaches. My biggest critique of the ‘scripted sequence” version is that you are trapped for too long listening to characters talk and relate important story details instead of actually *doing* something–this was a necessary side effect of making the two versions as similar as possible. As for the other bugs, I’m aware of a few but didn’t have time to fix them before the project was due. As some of you have also pointed out, the difficulty is actually balanced toward the easy side–this was intentional, as not all of my testers were FPS veterans and I wanted to make sure they could complete it without dying too often. 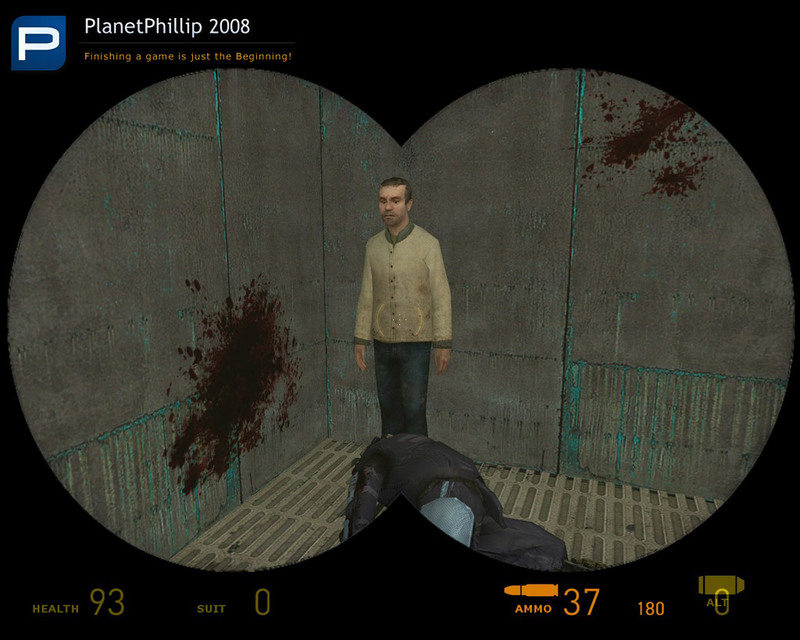 Lastly, as people have eloquently pointed out, the mod does require Half-Life Episode 2 content–that’s my fault for not mentioning that. I installed via Orange Box (which includes original Half-Life 2, Ep1 and Ep2 together) and so when I said it requires “Half-Life 2” I was thinking Orange Box version, and forgot there are multiple versions out there. Sorry for that mix up to anyone who’s had problems due to missing content! Anyway, just wanted to clarify where the project came from. Thanks for looking! I guess I played it all the way through. Mine ended with evryone outside by the jalopy and that was it. Very good but way too short.I hope the author adds to this as it’s the start of a good story and the map played flawless. I am in AWE of this mod. I agree that it is very short, but I played it three times just to make sure I hadn’t missed anything. I enjoyed this mod more than any other mod I have played for a long time. I will simply nod at the author(s) because I know exactly how hard they worked on the entity setup in this thing. Normally I am a bit picky about things like architecture and lighting, and there are some criticisms I could have made in this area. But I am not going to. I didn’t notice anything negative during the first two times I played – the immersion was so great. The story has real depth, and I felt emotionally involved with the characters. The voice acting is superb. The occasional fluctuation in quality … but overall very, very professional in all respects. My wife – who was watching TV on the other side of the room when I began playing – turned off the TV and came and sat quietly watching me. Afterwards we both remarked how well put together the whole experience was. Although short, this is among the very finest Source mods I have ever seen. This was amazing. I am also in awe. I’ve played it 4 times now, once in scripted sequence mode, the other 3 in cinematic. I have to say that I like cinematic more, mainly because jack has a voice. In this cutscene/scripted debate, I think that the perfect compromise would be to have scripted parts, while the main character has a voice. 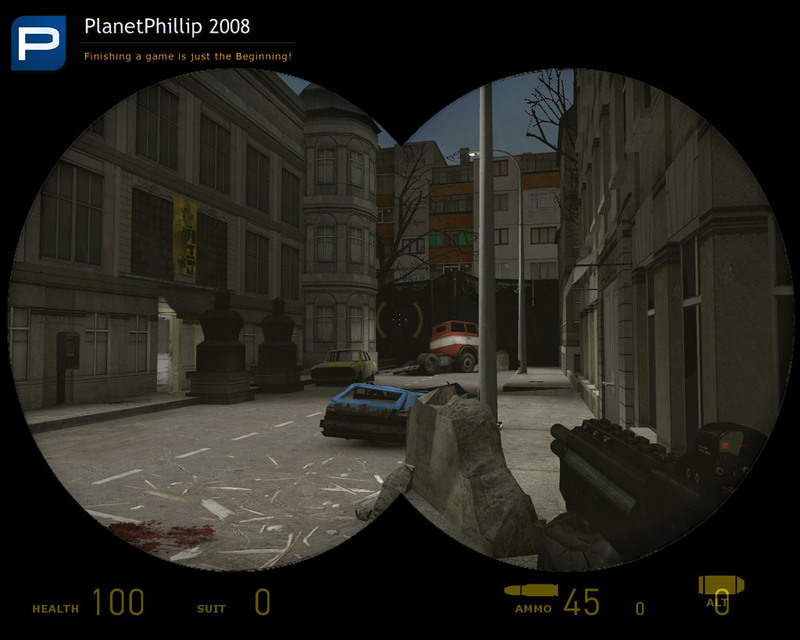 Cutscenes are fine in some games, crysis for example, because of the range of animations that can be done. In HL mods, there are only a few basic animations, so the cutscenes can’t be as cinematic. But overall, good job. I really, really liked the depth of the characters and the choices you have to make, even if you don’t get to feel the long-term effects. Great voice acting and script as well. 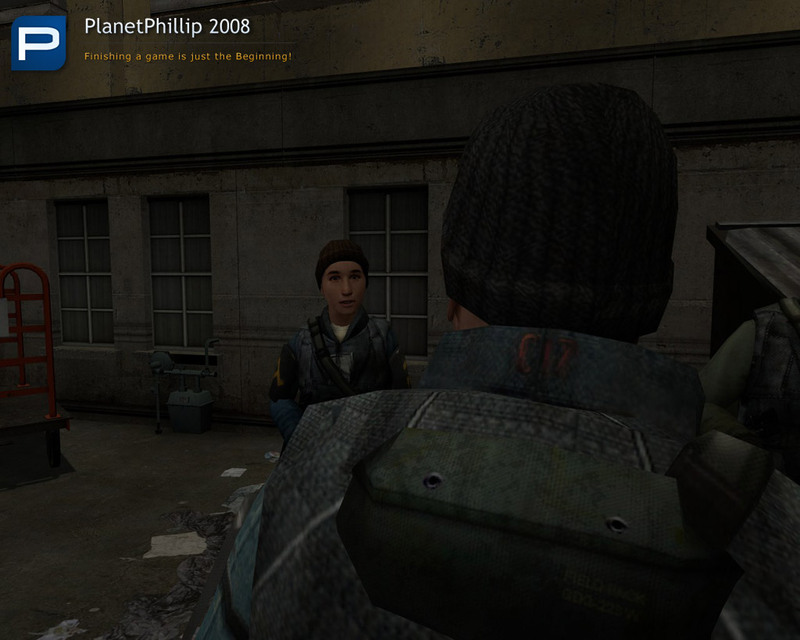 Thinking about it again, the reason that the scripted sequences worked in HL2, was that you could walk around and examine things other than the people you are talking to. Look at Kliener’s lab, Nova Prospect East, or White forest. Most of the time, there are little things which you can go around and look at and play with, rather than just sitting around listening to long exposition. While there are some sequences where you have nothing to do but listen to people talk (there isn’t even much to look at apart from the characters) these are normally kept to a minimum, or at least they are very short. In compromised, there are no places where being in the first person allows that degree of exploration, and thus the cut scenes are more interesting because you at least experience a bit more character interaction. 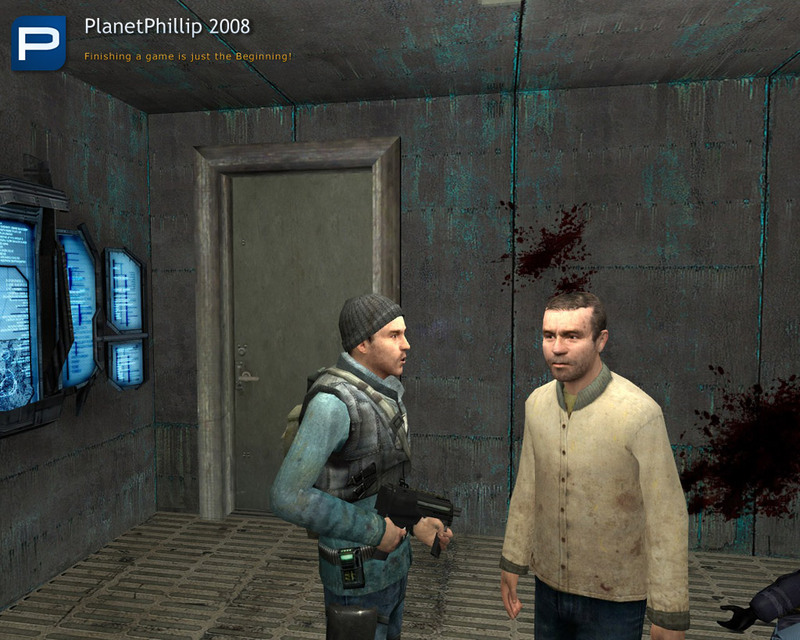 I played both version of this level and there is no doubt I like the scripted sequences version a lot more. I don’t like to see my character in 3rd person(especially in a FPS game), I want to be the eyes of the character. This way I become the character and feel more immersed. I feel very frustrated when I loose control in every conversation. I believe the story is best told given the player control in an enclosed area. Just like in this level, when talking to the team mates down on the ground. Works great. I agree with Phillip about the 50/50 portion between story and action. Especially playing the cinematic version, where I got bored waiting to regain player control. Throughout the level there are a lot of unecessary pauses, where you are locked – invisible walls, locked doors, no player control. Maybe just to slow the player down, avoid certain problems or just extend the play time. The level design is both good and bad. I really like the variation for such a short level. Up, down, tight, less tight, sneak, battle, defend… Sadly I managed to get lost early on, not finding where to go to enter the combine area. I feel there could have been better guidance here even though the route is very short. Didn’t make sense to me entering there. I had my focus in another direction because of previous action and the entrance is a bit generic. 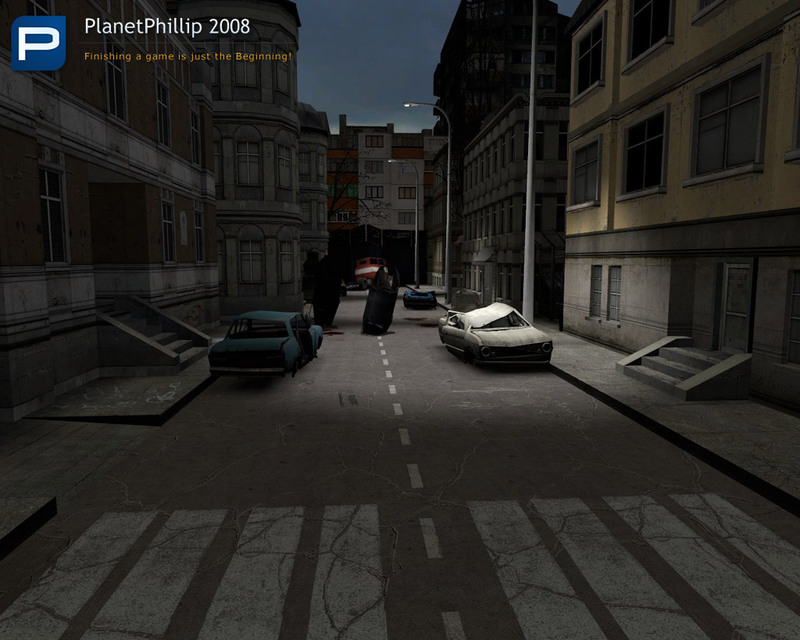 The gameplay lacks variation. Linear corridoor shooting with machine gun isn’t my favorite. I felt I should have been given a shotgun early on and less ammo for the machine gun. 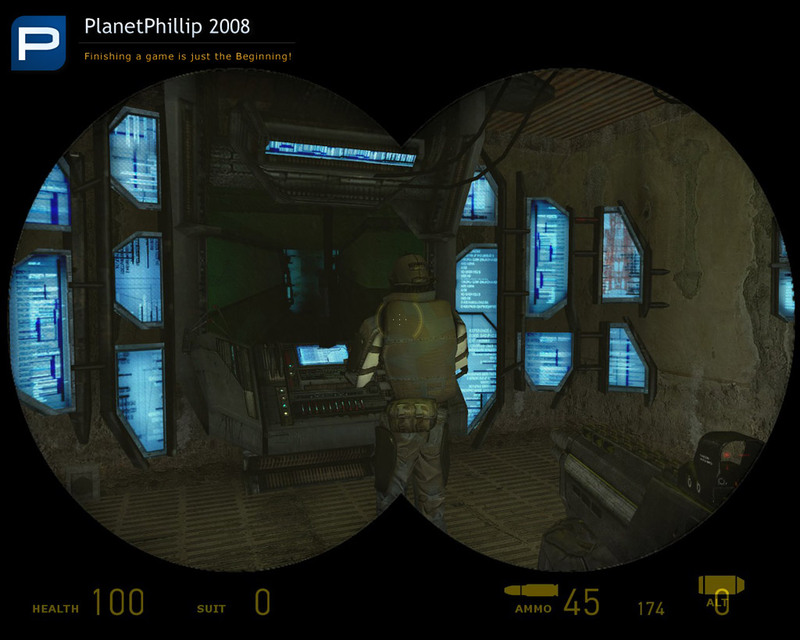 This would make for more interesting fights, forcing the player to change weapon when he runs out of ammo. The combine vision look aweful and ruin the experience. I almost quit because of this. But the feeling of being undercover was kind of good. I examined “my friends” for every step of progression I made and I love the point-of-no-return situation. From that point, to the end, I had the most fun. The last room should have been given more thought. It’s too tight and doesn’t make for good fights. And the choice issue didn’t really satisfy me. I didn’t like the timer and the hit “E” thing. I think there are better ways to present and execute these kind of situations. Reason why I played both version was to see the difference between cinematic and scripted sequences. I was also interested in the different endings. Ok finished them in cinematics and scripted sequences.. and to tell you the truth those cinematics are the best cinematics i’ve seen so far.. keep up the good work! Short mod. Some exploration, some combat. I agree with whomever said that in either the Cinematic or Scripted version, the problem was the forced break. In the Cinematic version, you got to see the responses of your character, which you didn’t have in the Scripted version; so it does fill in some of the story you wouldn’t otherwise know. This is a real peach of a mod in two versions. I suggest playing the Cinematic version first, it is only around ten minutes. Wait a further ten minutes and then play the scripted version. The comparison is most thought provoking. I found the cinematic version best because you have no choice but to listen, watch and absorb the information being offered. The bonus is that you, jack Carter, Sabrina Jackson and her captured father, Nathan are now characters in a story. This also changes your mission, because what was once just a name, is now Sabrina’s father. Needless to say I went against orders and risked everything to save him. It felt great to; especially when you find out he is Sabrina’s only living family! As for the life or death choice, the latter proved unpleasant and the cut scene made you feel a real sense of defeat. The scripted-scene version seems to loose a lot of the emotional element, due to lighting and the lack of a virtual camera. Plus you do not see yourself as a character anymore, just the player…..
Well-directed and acted cut scenes can elevate a game to an emotional experience for the player. Thank you Eric Bakutis, et all for an interesting mod experience. 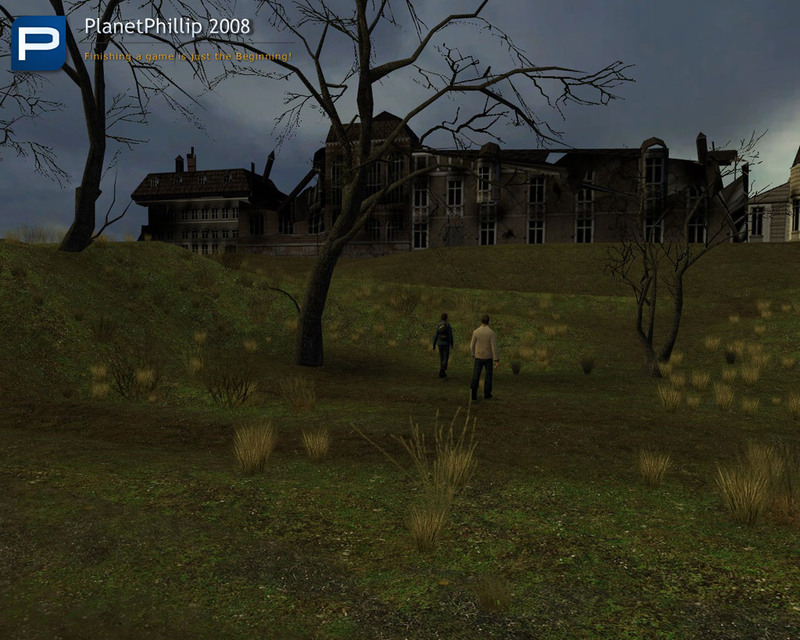 The mod uses the menu background from Lost Coast. How do I change that, and in the menu, there’s a pink-and-black box in the menu background itself. How do I fix that? I know it’s very minor, but it would be nice if anyone would tell me how to fix it anyways. Thx PP for adding a download link. It gave me same error but got it working with the help of the forums.steampowered link and am now working on missing materials. About the mod itself, it seemed rather dull but I guess that’s because that wasn’t the focus so no point in mentioning the really confusing architecture of the building, tight corridors and lots of doors and of course too much smg. No bugs, had no trouble pressing “E” (I used default keys). The Faceposer, lipsync stuff is actually top notch, I not only felt the words but also sensed mood changes. Voice acting was good tho was bit annoyed by my rebel mate’s voice, it was either recorded or converted into a lower quality than the rest of the voices so broke my immersion. As some other Guildhall projects, this stands out because one concept was successfully explored to the max and the final product is somewhat polished and bug free. But because other key elements of the mod were poorly made, like mapping and gameplay, I have to give it a ‘maybe?” for the entire Mod. You guys should really come together one day for a huge project, put each and all of your ideas together and I bet you’ll create something awesome! Hey, how do u made it work?? ?, I changed game info regarding the values from 420 to 218, but it din’t work please can u tell me how can I play this…? ?, freakin steam updates.! Can’t get this to work!!!!! Can anyone please tell me how to get past the array props error? Got past the array props error thanks to the forums. Now I get a memory error. Any suggestions?! Do other EP2 mods run okay? Also, try this thread, and scroll down to the EP2 fixes in purple. I very much enjoyed this one. 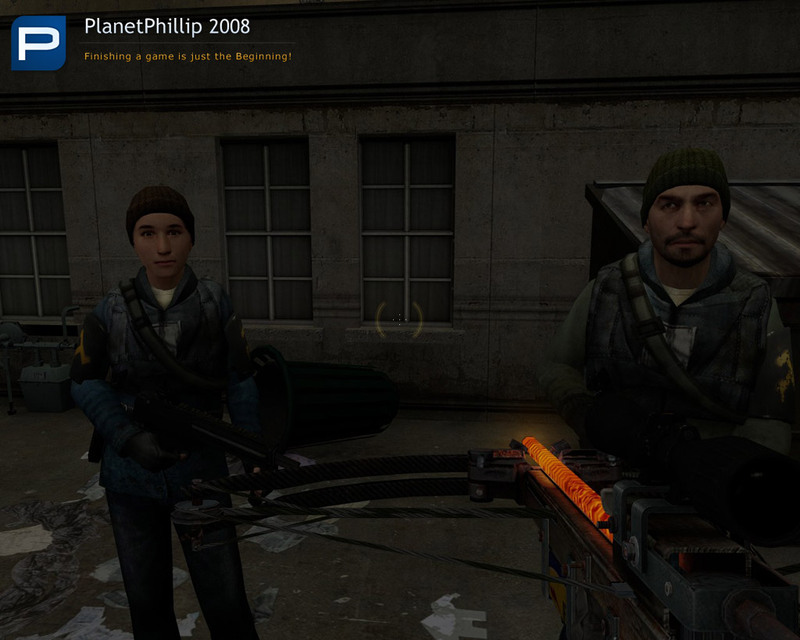 It’s short but very fun to play through, and I really like when mods fit in with the actual story of Half-Life 2. It was a bit hard to see through the combine mask, I would’ve preferred it be a bit less grimy, but it wasn’t impossible. 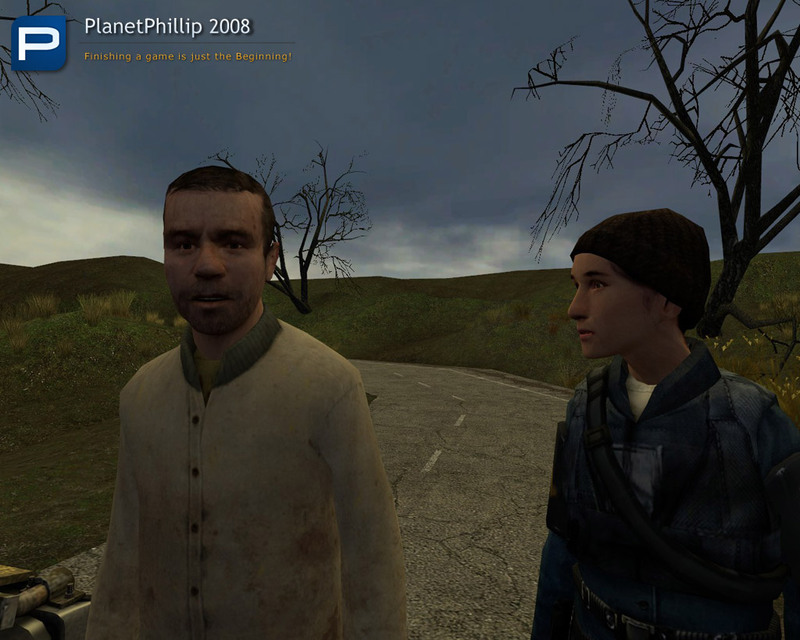 I actually quite like the dialogue, and while the voice acting is not professional, it was better than a lot of mods. The gameplay was very fun as well, it didn’t really have puzzles but it made up in strategy. The layout of the combine base was tight but not too claustrophobic, and if you explore a bit, you’ll know where you are in it when the shooting starts. I also like that there are two different endings, that’s always pretty cool in games (IMO). 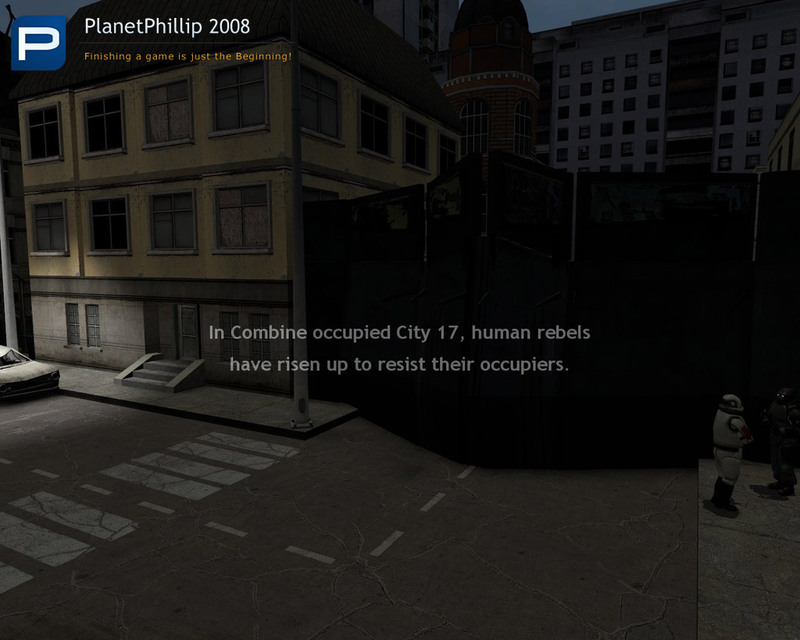 The visuals are also rather good, they portray City 17 very well. I definitely recommend you play Compromised, it’s both fun and interesting. I hope to see more story-based mods like this. Single map with strong story elements. There are 2 modes available for ‘silent protagonist, no cutscenes’ or ‘3rd person cutscenes, protagonist speaks’, where some people may prefer one over the other. I wish AAA games would have an option like this, but it probably wouldn’t work out since in some cases if the protagonist were silent then the story wouldnt make sense.